Retro 2: Why Do Women Continue with NST (the NaSTy habit) When It Feels So Bad? As part of my retrospective of intelligentwomenonly.com, I'm republishing an April 25, 2010 blog which asks an important question that I'm still wondering about. The more I've delved into neuroscience and learned how the brain works the more I am convinced that the underlying reason is very simple; once learned and practiced regularly, any habit is very hard to break, good or bad. Pop psychology can't help to eliminate NST. Nor can positive thinking, therapy, or religion. The negative self-talk habit is similar to an addiction; requiring a commitment followed by recovery which is long, hard, full of ambivalence, progress and regression. Finally after a year — or two — you're unstuck, more productive, confident and less stressed.What a relief, pleasure, a reward! During my presentation of "Break the Negative Self-Talk Habit" last week, Jennifer Waldron, a speech coach (jenniferwaldron.com) asked the pertinent question, "What's the payoff or hidden benefit for negative self-talkers?" There aren't research-based answers that I know of, but lots of theories about why women continue to put themselves down when it continues to make them feel so bad! • "The devil you know is better than the devil you don't know." Meaning that there's comfort in same old, familiar patterns. Changing to realistic thinking from NST may be scary — a risk that takes effort. • Negative self-talk, spoken out loud, elicits reassuring messages from friends and family.e.g. "You have a great personality Mary. There's nothing wrong with you." "Of course you're smarter than most of your co-workers. They must be jealous of you and that's why they avoid you." • The illusion that people who do a lot of negative self-talking are introspective, self-aware, and analytical as well as smart may keep the NST engine chugging. • Cultural changes noted by Susan Nolen-Hoeksema Ph. D. in Women Who Think Too Much. (http://www.amazon.com/) e.g. decreased strength of values, greater sense of entitlement, the need for quick fixes, and increased self-absorption. What thoughts do you have about why women — or you specifically, keep dumping on yourself even though it produces nothing good for you and may make you anxious or depressed or at least bummed out? I'd really like to hear your opinions and thoughts. Maybe you think it's really helpful to you and you don't agree that we should try to reduce our NST? I'm getting ready to review intelligentwomenonly.com this upcoming week, the first week of March 2012. I started this blog early in March 2010 although the first post didn't appear until March 29th. With a few minor changes here's that first post, slightly altered. Women, from 13 to 60 plus, are experts at negative self-talk, or "overthinking" as Susan Nolen-Hoeksema Ph.D. refers to the NaSTy habit in her book Women Who Think Too Much. http://www.amazon.com/Women-Who-Think-Too-Much/dp/B0001LUGU2/ref=sr Research shows that a larger percentage of women engage in negative thinking than men — and that it causes them to experience higher levels of stress. In my opinion, personally and as a psychologist, intelligent women are even more likely to indulge; perhaps they're perfectionists putting themselves down, maybe they think rehashing, questioning, investigating all angles in their mind, reflects an analytic mind, a tenaciousness to fix everything and get relationships going well. It doesn't. NST is just a bad habit, like biting fingernails, procrastinating, potatoing on the couch, that wastes time and energy and produces nothing useful. I'd like to hear some opinions, for or against or in the middle, from smart women out there. Is openness to experience the same as flexible thinking? Probably not, but closedness to experience is certainly farther away than openness. Although the research reported below targets older adults, I would guess that the same process works for younger adults too. "Abstract: The present study inves­ti­gated whether an inter­ven­tion aimed to increase cog­ni­tive abil­ity in older adults also changes the per­son­al­ity trait of open­ness to expe­ri­ence. Older adults com­pleted a 16-week pro­gram in induc­tive rea­son­ing train­ing sup­ple­mented by weekly cross­word and Sudoku puz­zles. Changes in open­ness to expe­ri­ence were mod­eled across four assess­ments over 30 weeks using latent growth curve mod­els. Results indi­cate that par­tic­i­pants in the inter­ven­tion con­di­tion increased in the trait of open­ness com­pared with a wait­list con­trol group. The study is one of the first to demon­strate that per­son­al­ity traits can change through nonpsy­chophar­mo­co­log­i­cal interventions." For example: If you're locked into negative self-talk, learning inductive reasoning (aka problem-solving thinking), doing cross word puzzles, learning Spanish or kick boxing, might bring about the similar flexibility of thinking and openness to experience. And, encourage you to be more hang loose, flexible enough in your thinking to say to yourself, "Let go of this silly waste of my time; negative self-talk. I'm smart, a realist, and though not perfect, I'm a sharp cookie. Give NST a break, give it up and move on." Change creates change. New experiences create new perceptions. Acquisition of new habits helps eliminate old habits. I bought my 3 year old grandson a book, Duck! Rabbit! by Amy Krouse Rosenthal. The above depicts the main theme. My grandson was sure it was a duck and insisted continuously that there was no rabbit. The book aimed to develop flexible thinking in young children — starting with the illusion and spreading to a flexible thinking pattern. 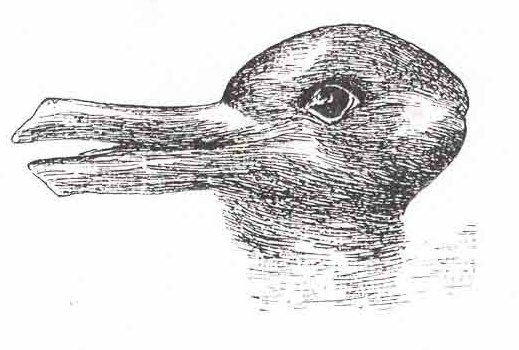 In adults, ability to flip back and forth between the duck and the rabbit with agility can be seen as a sign of potential for creative problem-solving. What's your potential, from 1-10? Does that match what your experience tells you about your creative thinking? Plus, what do you think of when you define creative thinking/problem-solving? I'll have more about my thoughts and research later this week. I'd like to hear from you along the way. I don't like the article I'm suggesting you link to, with, on(?) and I'm wondering what early or mid-career readers think about it. For me, the gender difference stuff has become overdone and irrelevant. This article sounds like diversity stuff from the late 1990s. It's not that the article doesn't have accuracy, but it's way outdated from my viewpoint. Who has the combination of skills that are needed to pull off the job that has to be done is what's important. Most of us are now working in team and (hopefully) collaborative environments, which demand that the whole is worth more than its parts. Some technical people don't have good relationship skills. Some great communicators don't have good mathematical skills. Some rational problem-solvers have no creative sparks. Men are different from each other. Women are different from each other. Men and women are different from each other. I'm beginning to think more frequently and intensely that the world needs to move on to more important issues related to workplace performance, management, GDP, productivity, measurement of success. How can we get more people to sign up for math and science degrees? What can we do to keep more kids in school and graduating from high school? How can we move forward to brave the fact that work is often hard, a struggle yet challenging, stimulating, and rewarding. Life is stressful. I was an early zealot about gender differences. My first book, Genderflex, Men and Women Speaking Each Others Language at Work, was based on research about gender differences in communication. That was 18 years ago! I'm an avid supporter of women, but lets focus on resources for support of education, achievement, accomplishment and success rather than the obstacles. Everyone has obstacles, either of their own making or of their business or personal environment. We can only change others by changing ourselves. HR can't do it. Legislation can't make it happen. We'll be valued for our skills when we don't NEED to be, even if we want to be. Here's a 3 minute video of kids and the marshmallow experiment — strategic allocation of attention. Very cute and evocative of grown ups stress avoiding temptation. I found it in an article on addiction and ego depletion by a PT blogger. I tweeted it if you want to read that too. Psychological distancing techniques have lots in common with strategic allocation of attention. If you check out these two links — http://intelligentwomenonly.blogspot.com/search?updated-max=2012-02-06T03:30:00-08:00&max-results=3 and http://intelligentwomenonly.blogspot.com/2012/01/self-control-will-power-or-strategic.html— or even if you don't — you can see the connection. Strategic allocation of attention, in relationship to stress involves REMOVING your attention from the person or event that's causing stress and ATTACHING your attention to something else. Re-allocating attention is a specific technique to increase psychological distance. Here's an academic definition of psychological distancing borrowed from researcher Angela Duckworth. "The ability to step back and re-evaluate a situation in representational terms to produce appropriate responses, rather than being dominated by immediate thoughts and surroundings." Both SAA and PD increase ability to manage work, to wait for rewards, and to regulate emotions. Miraculously, because of increase in metacognitive skills and experience, we get better with distancing strategies as we age. That's encouraging! Maybe that's a reason that older people are happier than younger people. They've learned distancing - cha, cha, cha - and experience less stress. • Asking children to think of the marshmallows as puffy little clouds helped them wait longer to eat them. By reframing the concept, the marshmallows were less tempting, and less attention getting. • For adults, when the moment is tense and full of conflict and emotion, literally stepping back, or even out, provides space to reevaluate, reflect briefly and respond on a cognitive level rather than an emotional level. • Even if your own negative self-talk is the stressor, the same distancing techniques work. Here are some more distancing, strategic allocation of attention techniques for this coming weekend. • Engage in a short burst of physical labor. Plant spring flowers. Wash the kitchen floor. Wash 4 small windows. Bake cookies. • Turn on the music, or change the music, or play some music on a harmonica, a piano, a drum. • Start a jig saw puzzle and keep it available, maybe at 7 minute stretches. • Stare into space. Sort of like meditation but with your eyes open. • Walk once around the block, in the rain, the snow, the sun. • Start an ongoing calming project — knitting, needlepoint, solitaire, crossword puzzles, Suduko, angry birds, that engages your attention but you can drop into or out of. • Think about: In the big picture of life (perhaps a mental image of the planet might help), how important is this moment, this issue, this conflict? • Imagine you take the negative self-talk, the circumstances, the person and in your mind send them into outer space via a rocket. Comment from a reader (A) asking for advice about how to handle a particular type of person (B) and communication style. The quote is altered to protect the guilty. Unfortunately the irrational, bullying style described isn't a rarity in person, on the phone, on e-mail or social media. Here's an approximation of the conversation. (A) "I don't think there's a definite answer to the question of whether the debt ceiling should be raised or not. There are pros and cons to both viewpoints." (B) "Your stupid comments and your wrong opinions have just publicly humiliated me and f----d up at least one important relationship. I'm pissed. You're a f------g idiot." The reader wondered how to handle this type of aggressive communication. Aggressiveness in return? Apology? Defense? Shut down and click the off button? "I've found that what works best is to not respond at all if it’s in an e-mail, unless the person asks a question, which I answer literally. E.g.”What kind of an idiot are you Judy?” “I don’t have an answer to your question.” Or if it’s in person or on the phone, let the person run down without responding at all, just listening. Then say good-by, good night and walk away. It’s the denial of impact approach. It's is not a win-lose and because it’s a chosen strategy, I don’t feel punched out. Those angry, bullying people are always better at it than I/you are. It never works to compete on their level. At least not in my experience." (A) didn't like my advice and thought a detached approach would result in bad feelings — and found a solution that worked satisfactorily. • Asked for and received an apology from (B). • Was asked for and didn't provide an apology to (B). • Commented that drama wasn't welcomed nor would it be tolerated in the future from (B). • Mentioned regret that the comment (A) made was upsetting and would not make such comments in the future. All seemed well! I added this possibility for the future to (A). "Try it (denial of impact) once with a lesser infraction or infractee. And read my post today about psychological distancing. I have gotten good at it over the years but fretted for a long time about winning, losing, fairness, my integrity, being a wimp, letting them get away with it, selling my soul etc. Now I find that by not getting engaged in the garbage I expend much less energy and time on the issue and it slowly leaves me. I do not forgive or forget, but become indifferent." How do you deal with this type of bullying or difficult behavior? I always read and learn from the Essay on the last page of the New York Times Sunday Book Review. The topic often relates to writers and the writing life as did the recent essay by Anne Trubek, "140 Characters in Search of An Author." I found the title misleading.The content focused on the continuing pressure for writers to emerge from the garret, open mind and soul, disclose their creative process, and round up fans through their efforts. "Social media sites like Twitter are demystifying the writing profession — and that may be salutary." Similar to the public speaking process, the new demand for authors to be entertainers, not just introverted people reading softly from their newest book, has produced proponents of yays and nays. • Is extroversion, telling all, way too demanding for many writers? Does it drain their time and energy, their routines and habits, the magic of their process? • The other side? It's the reality of the new world of publishing, social media, more openness by everyone. TMI?. Can't one hold in secrets about one's inner life? Not only secrets of bad behavior, but secrets of good behavior too. Since I write non-fiction, I don't have a very interesting creative process. I wouldn't mind talking about it, but listeners might not want to hear about it. Too boring. But those who write fiction and poetry, perhaps even memoir, might feel invaded by the demand to reveal their process. They might not even know exactly what it is; or fear that the genie would escape once the cork was popped. It reminds me of explaining what's funny about a joke. The telling ruins the humor. The out in the open mystical procedures evaporate the magic? NY Times, February 5, 2012 article about Sheryl Sandberg, COO of Facebook addresses her chosen mission as role model for women in business and technology. Promoting women is the cause. Her message for women, aim high and keep your foot on the gas pedal. Sandberg, a Harvard undergrad and business school graduate, is married with two young children, plenty of money, great job history and lots of contacts, connections, and fans. She also has critics who, while admiring of her talents, question the reality and validity of of her message. They cite her unusual circumstances, plus luck, as factors that the average bright, techie women can't easily duplicate, even with the gas pedal pushed to the floor. My opinion? So what if her rise to power, money and prominence (will she run for political office?) has been propelled in part by luck, good presentation and relationship skills as well as smarts? All women interested in computing and high tech won't have the same stuff, but they may have other assets that Sandberg doesn't have. I'm all for her. She's not anti-men. She's not pro all women for general reasons of equality. She's pro tech women for strategic reasons. Sandberg can inspire, motivate, support, push, and promote women who choose to aim high and achieve. They can't do it the same way she did — and may not even want to — but they still can do it. How about high level, skilled female leaders in other sectors of the work world adapt the message to their field? Retail, banking, manufacturing, finance etc. What's your take on Sandberg? Yay or nay? As the weekend approaches, start thinking about ways that you can have a relaxing couple of days; or at least one day. What are the anticipated stressors on that day? A birthday party for your 5 year old? New neighbors coming over for dinner? Yard guys renovating the back yard with loud noise all day? Getting everyone up and out on Sunday for church and brunch with grandparents? Work deadlines looming for next week? Spouse in a long-term lousy mood? • Five minutes of alone physical distance can help, preferable outside, but if not, in the shower, under the eaves, in the car or garage. • Five to twenty minutes of meditation in the morning of the rough day. Even if you've never meditated, don't know anything about it, sit quietly, eyes closed and work to empty your mind. • Repeat robotically, without judgment, quietly or out loud, "I'll handle this well. One step at a time." • Slow your breathing, counting to 20, if you feel your heart beat rising and pounding with frustration, anger, or anxiety. Repeat as needed. • Imagine yourself surrounded by plexiglass, impermeable to outside forces, physical or interpersonal or social. • Imagine you are watching yourself on screen as if you were in the audience at a movie theater. Keep moving your seat further back. • Distract, divert attention when possible to reading a book, doing a puzzle, watching the moonrise, cleaning out a drawer. Give it a shot. Even if your life is mostly chaotic, most of the time, it's a huge relief to know that you can find moments of coping that reduce the exhausting emotional intensity — for the moment. "Just What is Authenticity, Anyway?" Karen Wright wonders in her PT blog/article "Dare to Be Yourself.". Link below. Below is an excerpted paragraph from Wright's article. The question she asks has been on my mind since the word authenticity became hot. Motivational speakers spoke of it reverently at conferences, corporate training extolled the authentic leader, therapy clients searched for their authentic core. Although the word and the philosophy of existentialism are centuries old, authenticity burst into the fore in the last ten or fifteen years when our culture began to realize that not much was "real" anymore. Not food or smiles, breasts or fabrics, rules or values. Psychology sees authenticity as the result of the inner self (whoever that is) managing to stay uninfluenced and unmarred by the outer socio/cultural world (whatever that is). H-m-m-m. How can that happen? Even to an infant? How many people can even figure out what their inner self is — really? How do we know that our self-awareness (whatever that is) hasn't already been so biased by the outside influences (whatever they are) that we can't possibly be real? I'm constantly doubtful particularly when people tell me they are authentic, or they ask me if I am an authentic person. Who knows? Regardless I thought this was interesting. What do you think about the authentic self thing? Please comment below. Being true to oneself is not for the faint of heart. Just What Is Authenticity, Anyway? Psychologists long assumed authenticity was something too intangible to measure objectively. Certainly Michael Kernis did when, around 2000, graduate student Brian Goldman approached him about making a study of individual differences in authenticity. "I said, 'Well, you can't do that,'" recalls Kernis, a social psychologist at the University of Georgia in Athens, "because nobody thought you could." But the two plunged ahead, reviewing several centuries' worth of philosophical and psychological literature. They came up with a technical description of authenticity as "the unimpeded operation of one's true or core self in one's daily enterprise." Kernis and Goldman (now at Clayton State University) identified four separate and somewhat concrete components of authenticity that they could measure in a written test. The first, and most fundamental, is self-awareness: knowledge of and trust in one's own motives, emotions, preferences, and abilities. Self-awareness encompasses an inventory of issues from the sublime to the profane, from knowing what food you like to how likely you are to quit smoking to whether you're feeling anxious or sad. Self-awareness is an element of the other three components as well. It's necessary for clarity in evaluating your strengths and (more to the point) your weaknesses: acknowledging when you've flubbed a presentation or when your golf game is off, without resorting to denial or blame. Authenticity also turns up in behavior: It requires acting in ways congruent with your own values and needs, even at the risk of criticism or rejection. And it's necessary for close relationships, because intimacy cannot develop without openness and honesty. Kernis and Goldman have found that a sense of authenticity is accompanied by a multitude of benefits. People who score high on the authenticity profile are also more likely to respond to difficulties with effective coping strategies, rather than resorting to drugs, alcohol, or self-destructive habits. They often report having satisfying relationships. They enjoy a strong sense of self-worth and purpose, confidence in mastering challenges, and the ability to follow through in pursuing goals. Whether authenticity causes such psychological boons or results from them isn't yet clear. But they suggest why people crave authenticity, as those low in authenticity are likely to be defensive, suspicious, confused, and easily overwhelmed. Considering the psychological payoffs, Kernis and Goldman ask, "Why, then, is not everybody authentic?" My answer? It isn't easy to be authentic, nor to know if you are, and there are many times and situations where you probably shouldn't be authentic.